The town of Kells or Ceanannas Mór, meaning great fort, is known to have been a royal residence before St Colmcille established a religious settlement there in the middle of the sixth century. St Colmcille, also known as St Columba, was exiled from Ireland several years later and established a monastery on the Island of Iona. 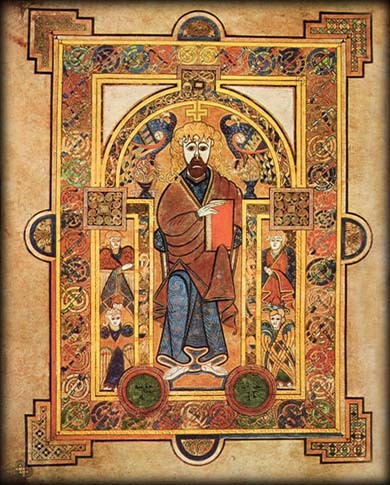 Traditionally it is believed that St Colmcille was involved in a dispute with St Finnian of Movilla Abbey over a Psalter. This dispute led to the Battles of Cúl Dremhne and Cooldrevny in 561. The battles resulted in three thousand men losing their lives. Colmcille was held responsible for the loss of lives and was sent into exile. Columba spent the next thirty four years preaching to the picts in Scotland where many converted to the Christian Faith. Colmcille died on the island on the 9th June 597 AD. The abbey on Iona was renowned as a centre for learning over the following centuries and its scriptorium produced many important documents and books. The Book of Kells is thought to have been started here. The monastery practiced the traditions of the Celtic Church and as the Roman Church became more powerful the role of Iona and Celtic Christianity diminished. In the latter part of the eighth century the monastery was plundered many times during a series of Viking raids. The monks decided to abandon the island and move their treasures to the monastery at Kells. The remains of the monastery are situated in the churchyard of St Columba's Church of Ireland Parish Church. The surrounding streets follow the oval shape of the outer enclosure of the monastery. 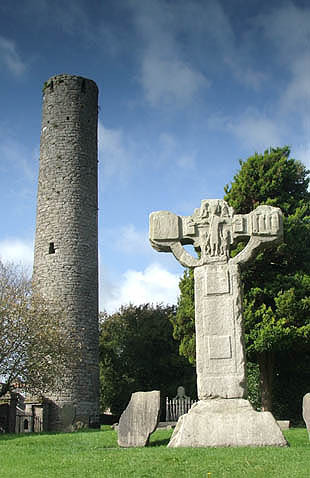 Inside the churchyard there is a round tower, three high crosses and the base of a fourth high cross. 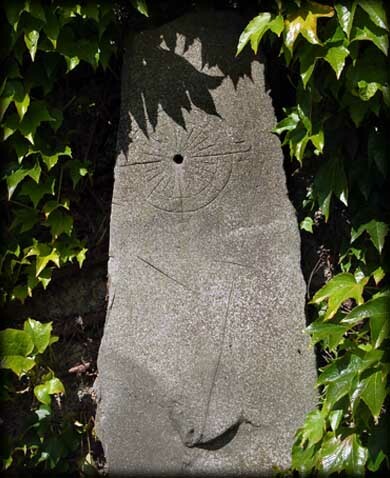 Lying against the south wall of the modern parish church is the sundial pictured above. To the north of the church is a bell tower which is all that remains of a medieval church. The spire was added in the 18th century. 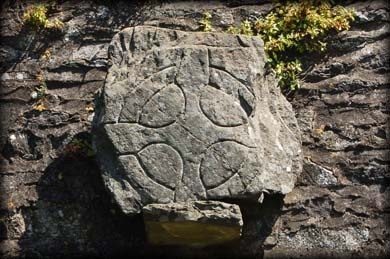 Above the south doorway are the beautiful head carvings featured at the top of this page and mounted on the west wall is the cross slab pictured right. 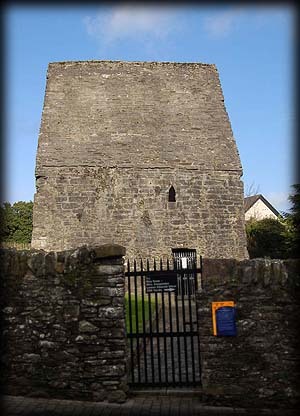 Situated on Church Lane on the outside of the north wall is the stone oratory, pictured below, known as St Columb's House. Outside the old courthouse on the R147 is a fifth High Cross known as the Market Cross. Latitude: 53° 43' 42" N. Longitude: 6° 52' 51" W.
The ancient stone oratory known as St Columb's house has an extremely steep roof. The original entrance to the oratory was built into the western wall seven feet above ground level, but this has now been walled up and a modern entrance has been added to the south wall. The oldest part of the building dates to around the 9th century. The oratory is situated on the road to the right of the main entrance to St Columba's Church and can be seen from the church grounds. It is thought that this small building may have have been constructed to house the relics of St Colmcille brought here from Iona. Other structures dating from this period, which may have had a similar use, include St Molaise's House on Devenish Island, Temple Ciaran at Clonmacnoise and Labbamolaga Church, Cork. Situated: In the centre of Kells. Discovery Map 42: N 7394 7591. Last visit Aug 2013.